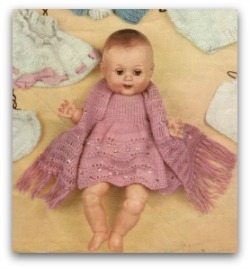 These knitted doll clothes patterns are make up using Lavenda Baby Wool 3 ply. 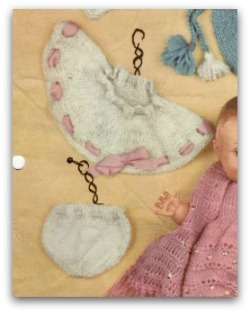 But of course you can use any yarn you choose. Just make sure you come up with the same gauge that is used in the pattern, you will have the size you want than. 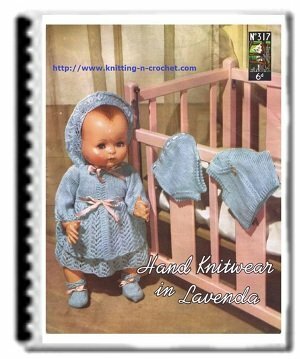 The Lavenda Double knitting outfits will fit any 13 inch baby doll. (No. 9 needles (American size 4) Double Knitting). 1 oz. 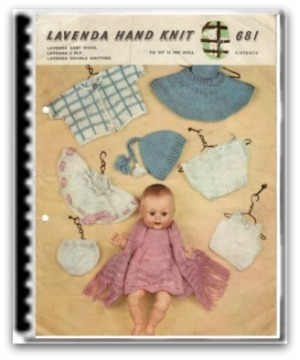 Lavenda Baby Wool for Pilch (gown), Vest and Waist Slip. 1 oz. Lister's Lavenda 3 ply for Dress and Stole. 2 ozs. Lavenda Double Knitting in Dark shade. 1 oz. Lavenda Double Knitting in Light shade. 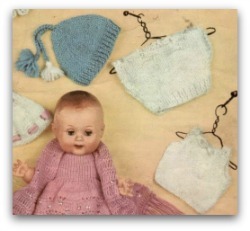 Pair each needles Nos. 9 (American size 4) and 10 (American size 6). Sequins for Dress and Stole. Elastic for Pilch and waist slip. Be sure to buy enough wool to finish the garment. Gauge:. 6. sts. and 8 rows equals one inch – 7 sts. and 10 rows equal one inch. N.B. 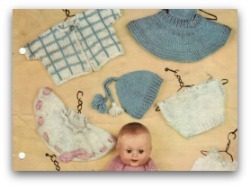 The tension (gauge) of the knitting controls the size of the finished garment. Before commencing cast on 15 sts. and work in one row knit one row purl for 20 rows. If your sample has less sts. per inch than our tension, try again with smaller needles and vice versa, then worrfc the garment on the needles whit produce our tension. Abbreviations This is a pattern from England so the abbreviations may be a bit different but the knitting is all the same.